About $40 million more in federal funds for the State Housing Initiatives Partnership Program (SHIP), which helps make affordable homes available, will be coming to the state this year than last year, Don Hadsell, director of the Office of Housing and Community Development in Sarasota, told the Sarasota County Commission this week. The good news, Hadsell continued during a Feb. 10 presentation, is that the Senate Appropriations Committee of the Florida Legislature already has voted to increase SHIP funding for local governments to $185.8 million this year, which would give Sarasota County $3.6 million. The bad news, Hadsell added, is that the State House has voted to reduce the allocation to $47 million, which would mean $600,000 for the county. That gap is something that will have to be worked out before the Legislature adjourns in March, he noted. Last year, the Legislature turned over $105 million to local governments, but it “swept $75 million out of housing [funds] into other uses,” Hadsell pointed out. As a result, Sarasota County ended up with $2 million. 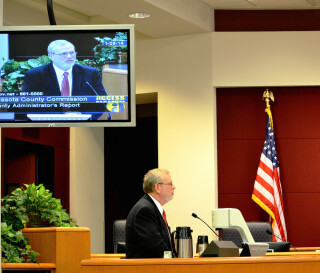 Hadsell was appearing before the board during its regular meeting in Sarasota to provide an update on the work under way on the next five-year Consolidated Plan, which will set forth City and County of Sarasota funding priorities for federally funded housing programs for the period of 2016-2021. The plan will be submitted in August to the U.S. Department of Housing and Urban Development (HUD). In November 2015, he pointed out, he appeared before the board to gain its recommendation for funding priorities. Those were advertised throughout the community, he added; the comments were provided to the commissioners. “Today, I am asking that you accept those priorities and to assign the federal and state funding to those priorities,” Hadsell told the board. According to the draft funding plan provided to the commissioners in advance of the Feb. 10 session, “Coordinated Entry” is at the top of the high priorities list, with a total of $5,250,000 in county funds and $650,000 in city funds. A Feb. 10 memo from Hadsell to the board said the county will provide $1,725,000 for Family Haven Case Management services, while an estimated $4 million in new funding will be used “to develop the coordinated entry system supported by a shelter and/or triage center.” The city’s money would go toward shelter beds at The Salvation Army. The second item under high priorities is Rapid Rehousing for the Chronically Homeless, while the third is Permanent Supportive Housing. The draft chart Hadsell provided the board lists $1,195,500 for the Rapid Rehousing line item and $9,225,000 for Permanent Supportive Housing. 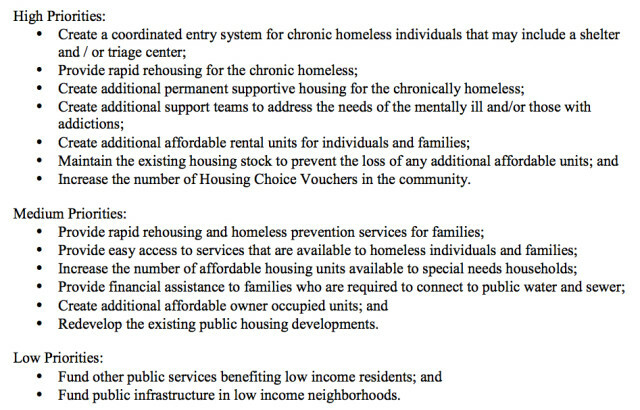 Regarding the former, the Feb. 10 memo says that money would provide housing for four months for about 350 chronically homeless individuals. As for the latter: The Feb. 10 memo explained that in addition to state and federal grants, it encompasses $1 million in continued county funding for Harvest House MLK Properties to create about 80 additional housing units for chronically homeless individuals. That each of the priorities targeted to helping the homeless be changed to add the phrase, “using the Housing First approach,” which has been a priority of the Sarasota City Commission. The establishment of a new priority to support housing identification, housing inspections and landlord identification. 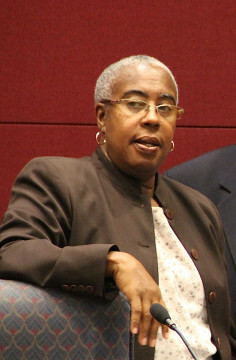 The memo explained that the six-member county steering committee that develops the Consolidated Plan felt that each nonprofit agency receiving funding should be allowed to use its own methodology to prioritize needs. The committee “did not wish to mandate that all agencies” use the Housing First approach, the memo added. Additionally, the committee members felt the second suggestion did not need to be listed as a separate priority, as it is “implicit within the other priorities,” the memo noted. Mason made a motion to approve the priorities for use of state and federal funds in the Consolidated Plan, which will be in effect from Oct. 1, 2016 through Sept. 30, 2021, and the amount of funding for each of the priorities. Vice Chair Paul Caragiulo seconded the motion, which passed unanimously.